The Office will always go down as one of the greatest television series of all time since airing in 2001. The ‘mockumentary’ sitcom was written and directed by Ricky Gervais and Stephen Merchant and the show’s awkward humour and wonderfully simple concept captivated viewers completely. To mark The Office‘s 16th anniversary, Gervais took to Facebook yesterday (Sunday, July 9) to reveal the inspiration behind three of the show’s main characters. “I had David Brent as a character from about 1995 I’d say, and he is based on people I’d met throughout my adult life,” he wrote. “The very first scene of the series, where he is talking to the forklift truck driver, is based on an interview I had at a temp agency when I was 17, in the school holidays. He was in his mid-thirties wearing a bad suit. His opening sentence was, ‘I don’t give sh—y jobs’; I just looked at him and nodded. “He said, ‘If a good guy comes to me… [he pointed at me to let me know he already knew I was a good guy] and says I wanna work hard because I wanna better myself, then I will make that happen.’ He phoned his friend and at one point said, ‘Yes, of course he’s 18,’ then he winked at me and did the Pinocchio nose mime. (It was nothing to do with fork-lift truck driving but it was for work in a warehouse). Talking about character Gareth Keenan, Gervais continued: “Gareth is even more of a fool than Brent in many ways. And even more immature. There’s a very good reason for that. Finally, the comedian revealed his inspiration behind one of the most beloved characters on the show: Tim Canterbury. “Tim is based on a guy I used to work with, mixed with Norm from Cheers, a little Chandler from Friends, and a touch of Oliver Hardy,” Gervais explained. The Office is available to view on Netflix. Is there some reason that my coffee isn’t here? Has she died or something? Those chilling words can only have come from the immortal lips of Meryl Streep in her iconic role as Miranda Priestly in the hilarious fashion comedy (is that a thing?) The Devil Wears Prada. This year celebrates the 10th anniversary of the release of The Devil Wears Prada – the ultimate terrifying insight into the word of fashion magazines. In the film, Anne Hathaway stumbles into the dream job of being PA to the editor of a high fashion magazine. She quickly discovers that her boss Miranda (Meryl Streep) is an absolute nightmare and has her working all hours of the day doing both the most menial tasks and the utterly impossible. Miranda’s character is said to have been based on Anna Wintour, Editor of US Vogue – one of the most notoriously intimidating people on the planet. In celebration of the best bullying boss out there, we put together some motivational quotes from some of the scariest TV bosses to inspire you to greatness. The details of your incompetence do not interest me. Take a leaf out of Miranda’s book and ensure you create an atmosphere of absolute fear. Aside from his evil ways, just seeing this creepy, spindly old man every day would be enough to put you off your break time doughnuts. Live fast, die young? Not my way. Live fast? Sure, I live too bloody fast sometimes but die young? Die old. That’s the way. Follow Brent’s philosophy and break the mould, don’t stick to the rules. Show your employees just how truly rock ‘n’ roll you are. 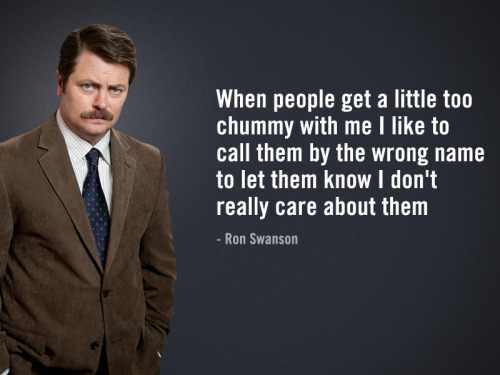 Take control of your workplace like manly man boss Ron Swanson. He takes no prisoners. He writes letters to vegans telling them to reconsider their lives. Are you this rude to all your patients? Oh yes, don’t think you’re special. If you work in a customer facing role, make sure you focus on results and don’t worry at all about being polite or friendly to your customers (or patients as the case may be). Don’t let your employees think that you’re saying nice things about them. Always use backhanded compliments. Why must I be surrounded by frickin’ idiots? Dr. Evil doesn’t beat around the bush. If an employee’s not working well for you, get rid of them. Make sure you always know what your ultimate goal is, and exploit your workers as much as possible to achieve that goal.